My fourth great grandmother was Anna Krčmarská who married Josef Šumbera on 5 October 1842. According to this record, Anna was the daughter of Joseph Krčmarský Bauer of Nová Bělá 36 and Marianna daughter of Johann Tomanek of Velké Kunčice (Groß Kunzendorf, Kunčice nad Ostravicí). She was 26 when she was married in 1842, giving her an estimated birth year of 1816. 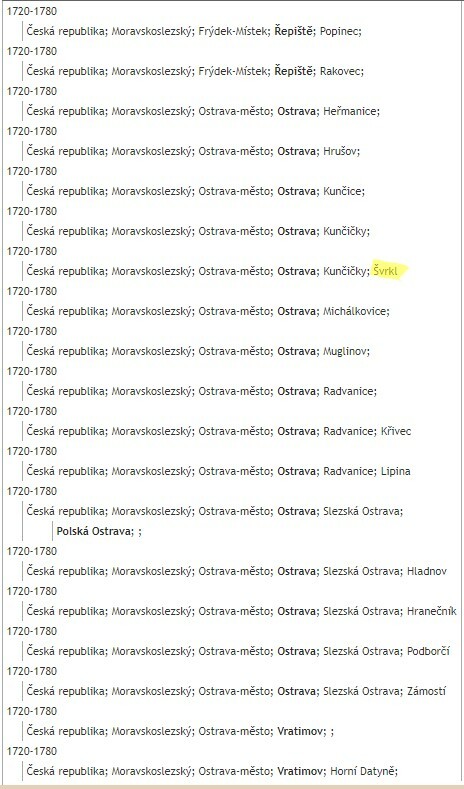 However, no Krčmarský’s were born in Nová Bělá between 1784-1827 (see this index), and the birth records for Velké Kunčice are missing from ~1780-1835, so for a very long time I was not sure where to even look for her birth, if not these two villages. I did find that Anton Stephen Krčmarský was born in Nová Bělá 36 on 25 September 1827. Notice that the surname Havranek is crossed out, inexplicably. 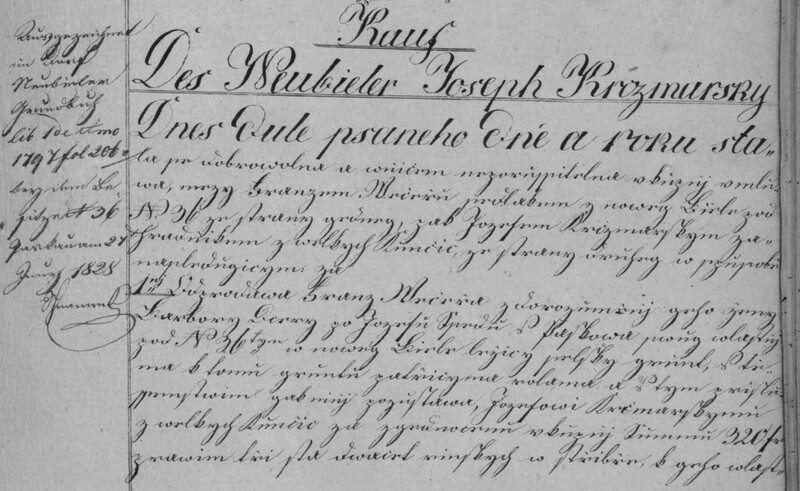 I also noticed that on the same page was a birth in Nová Bělá 25 on 17 June 1827 of Franz son of Joseph Havranek, Bauer of Nová Bělá married to Marianna daughter of Wenzl Krejčižek, Hausler of Stará Bělá. Josef Krčmarský had no other children in Nová Bělá. I knew Anna was born ~1816, so I assumed that her parents must not have been living in Nová Bělá in 1816, and that therefore sometime between 1816-1827 they must have moved to Nová Bělá 36. I did not know where he was from exactly, but I assumed that I should start the search in Velké Kunčice because that is where Marianna Tomanek was from. I estimated that Joseph Krčmarský was probably at least 25 years old when his daughter Anna was born in 1816, so he was born before 1791. The parish registers for Velké Kunčice births exist for 1720-1780, although without any kind of index. I decided to look there anyway for a Krčmarský, starting from 1780 and going backwards. I was really excited when I found a Josephus Kirčmarčik born 20 August 1779. Where the heck is Švirkel? Nothing showed up for Švirkel or Svirkel on GenTeam.au. I found Svrnkl in Slezská Ostrava on FamilySearch Parish Finder, and looked it up on GenTeam.au. It seems to be the exact same information. I kind of threw my hands in the air – this just directs you to the ZAO website. And “Slezská Ostrava”, no offense, is not very specific! I actually kind of love this little outline of jurisdictions. It is very helpful. It shows that Švrkl (no n!) was in a place called “Kunčičky”. So I decided from there to look at a historic map of Kunčičky to see if I could find Švrkl there somewhere. I compared it with the historic map on mapy.cz to get a better context of the missing pieces of the map, and discovered something very important. Cztwrtkel (haha! What a great spelling!) had actually significantly easier access to the church in Bartelsdorf than the church in Gross Kunzendorf. Gross Kunzendorf did not even have a church building. It shared a building with Vratimov. I decided that I should look in the Bartovice records (Bartelsdorf), which hopefully didn’t have such terrible gaps. And that is how I found the births of these children! Anna born 10 April 1817 at Bartovice 43 <– This is my fourth great grandma! I was so happy to find all these children! I also thought that for sure this meant that my Josef was the one born in Bartovice in 1779. I decided to also look for clues in the pozemkové knihy. I started this research in 2014 before I knew anything much about Czech land records. It was extremely difficult for me to decipher the letters much less to make any kind of sense out of the meaning, and eventually I could sense that I was probably making some errors. I will show you why. 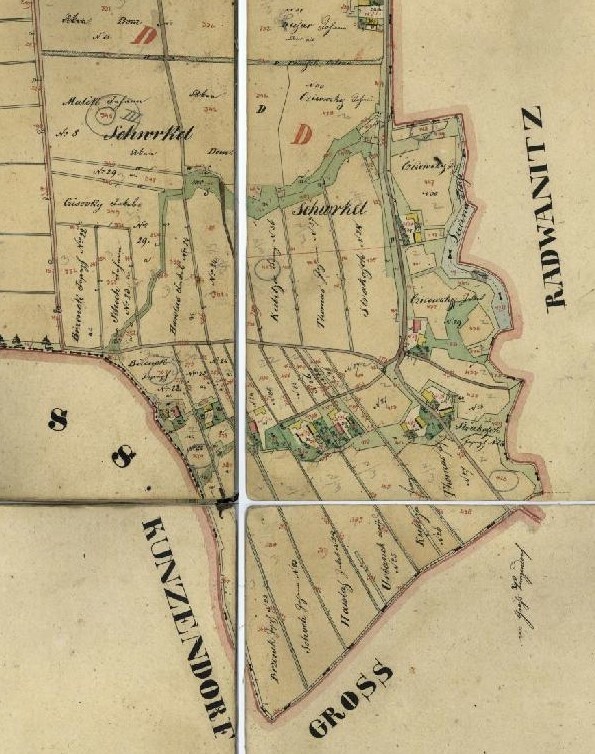 I started by looking for land records for Kunčičky, specifically Hlavní kniha pro Kunčičky a Švirkl 120. …but they were in Velké Kunčice. Like literally, just numbers 42 and 43, right next to all the other Švirkl houses in Kunčičky. I was not sure if they were numbered by some different numbering system, like for Velké Kunčice for example, but I decided it could not hurt to look in the Velké Kunčice land records. I looked in Velké Kunčice 6 and found that Velké Kunčice 73 and 43 seem to be…the same house? 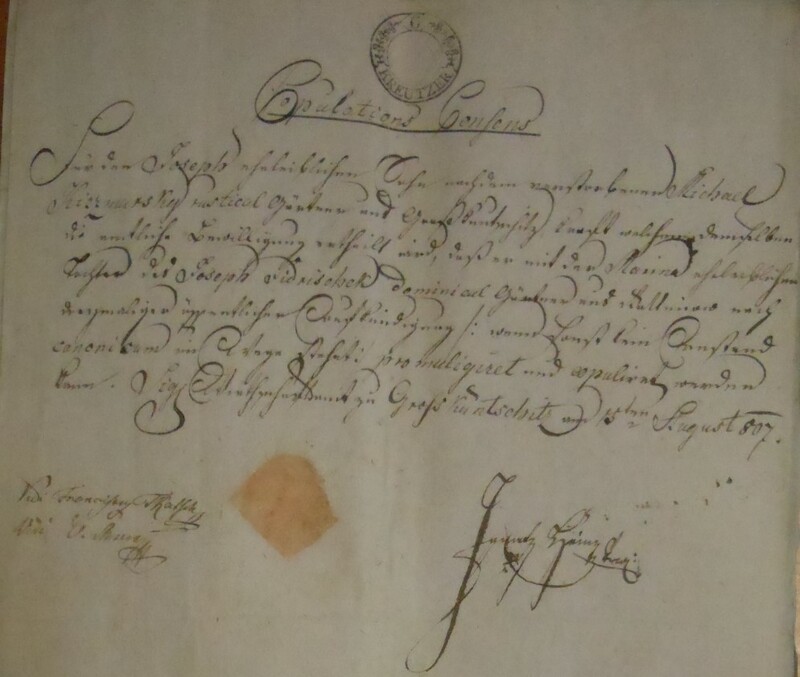 The first record seemed to be of Joseph Kirčmarský buying or otherwise acquiring Velké Kunčice 73 on 9 May 1807 from his deceased father Michel Krčmarský. Other heirs were Joseph’s sisters Marina and Anna. A few pages later, in a record that seems to be about the same house but is weirdly now called Velké Kunčice 43 (I really don’t get this! 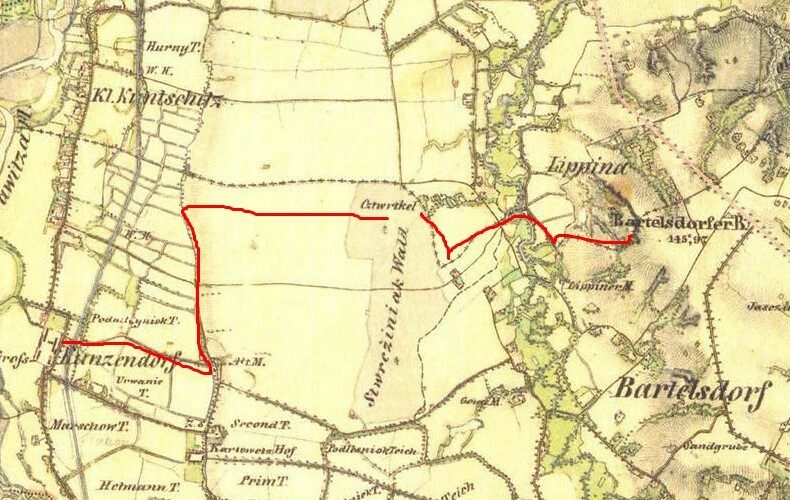 ), Josef Krčmarský sells Velké Kunčice 43 on 12 July 1824 to Joseph Waschiczek of Vratimov, somehow connected to a marriage contract on 28 August 1812 to Marianna. My paternal line is the Vašíčeks in Vratimov 25. I immediately wondered how this Joseph Vašíček fit into that other family. 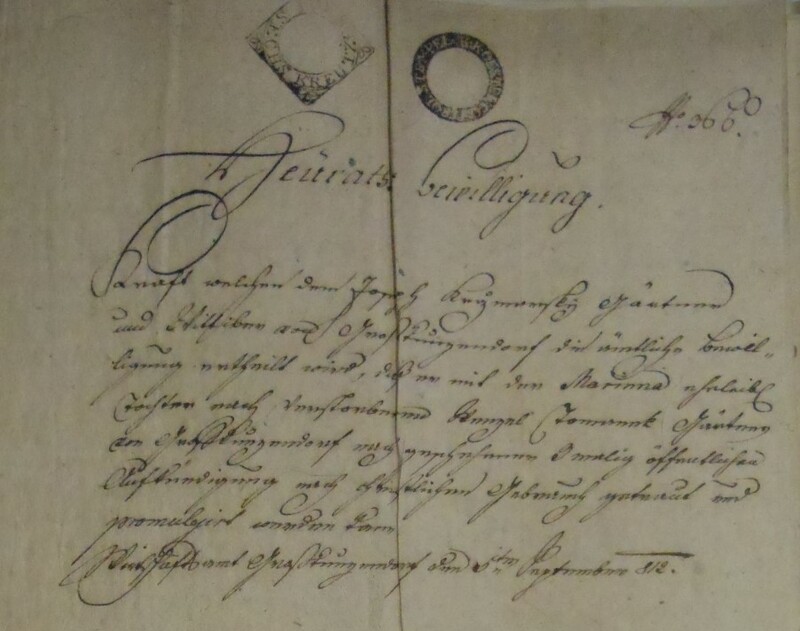 I thought I had proved that Josef Krčmarský was the son of Georg and Apollonia, born in 1779 in Švirkel, when I found all the records for my Josef Krčmarský’s children from his first and second marriage in Bartovice. How could he both be the son of Georg and the son of Michael? I thought that maybe Josef Vašíček married Josef Krčmarský’s sister Marianna, and that is why he got the farm in this way. After all, why else would a marriage contract be mentioned? At this point, I knew that I was liable to make some terrible mistakes because I simply did not have enough ability to read and understand these records. I did not want to draw the wrong conclusions, and I was really frustrated. Before putting it aside for a few years, I decided to figure out when Josef arrived in Nová Bělá, and if it could even have been around 1824. 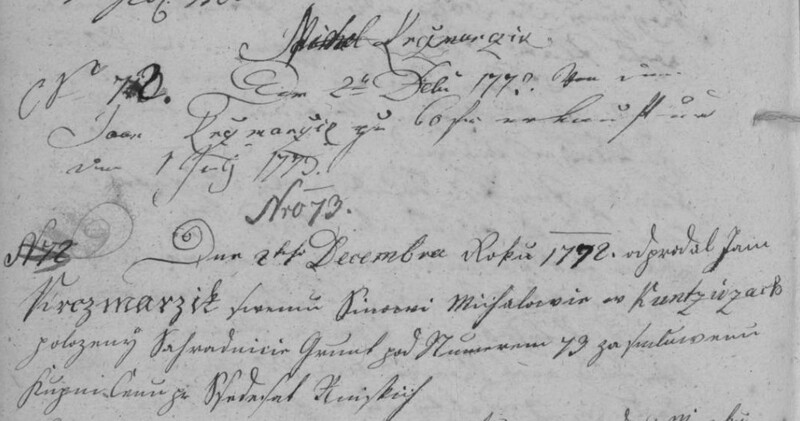 I started by lookin in Hlavní kniha 277 for Nová Bělá 36 because the year range was 1798-1883, so it included that 1816-1827 time period in which Josef Krčmarský arrived. Sure enough, I saw that he first shows up on page 36, and it looked like the previous owner was Georg Havranek. I found that Joseph Krtschmarský seemed to have bought Nová Bělá 26 on 28 October 1827 from Franz Wetschera (not Georg Havranek?) for 320 fr. I could see that there was a reference to another book (Verrerksbuche?) from the year 1827, page 36, with the purchase contract (kaufkontrakte) dated 28 October 1827. I thought it was probably referring to Kniha listin 256 for Nová Bělá for the years 1827-1829. Sure enough, there it was, right on page 36 (kind of ironically, since it is for house 36!). From what I could see, most of these paragraphs were about Franz Večera. Actually, the next pages are, too. But it squarely dated him in this place on 29 September 1827 at least. So it did not surprise me that much when in 19 March 1843 at Nová Bělá 25 died, age 63: with an estimated birth of 1770. I did not really know why he seemed to die in Nová Bělá 25, and I was also really confused about the seeming “Michael” discrepancy. I knew I was missing something, but I could not figure out what. So that is when I reluctantly put the research aside for a while. Flash forward four years. I am home sick on a Sunday afternoon, and I decided to pick up the research again. My cousin Roman Vašíček and I went to SOkA Frýdek-Místek where I spent a lot of time photographing the vystěhování records, and meanwhile he photographed all the permission to marry records. 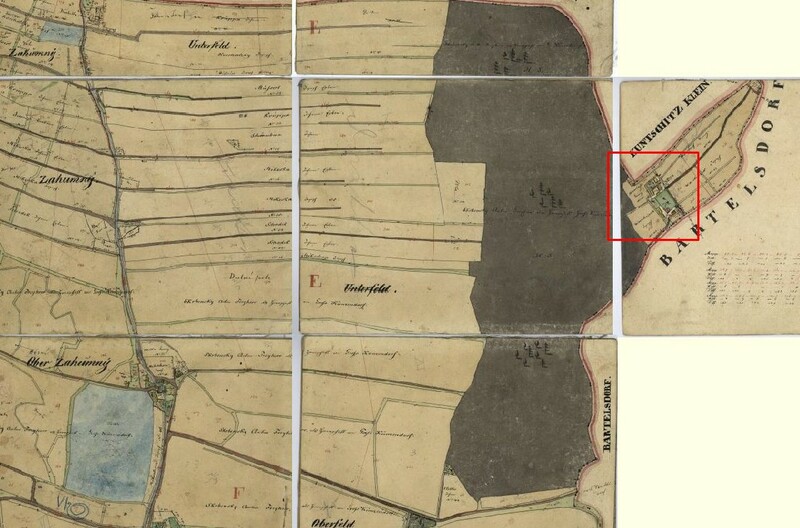 These cover part of “the gap” of missing parish registers, so they are extremely important to us. He photographed them in entirety, and I plan to make them available on this site as soon as I can figure out how to do that. 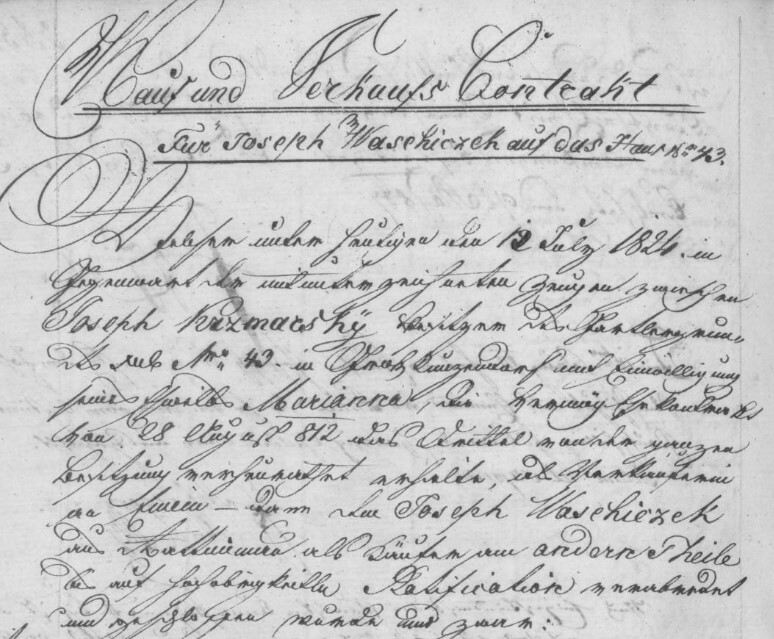 They received permission to marry on 15 August 1807, and Josef Krčmarský is the son of Michael Krčmarský, rustical Gärtner of Velké Kunčice. …and later he and his second wife, Marianna Tomanková daughter of Wenzel Tomanek, received permission to marry on 5 September 1812. Too bad this record does not name his father, only mentioning that he is a widower. 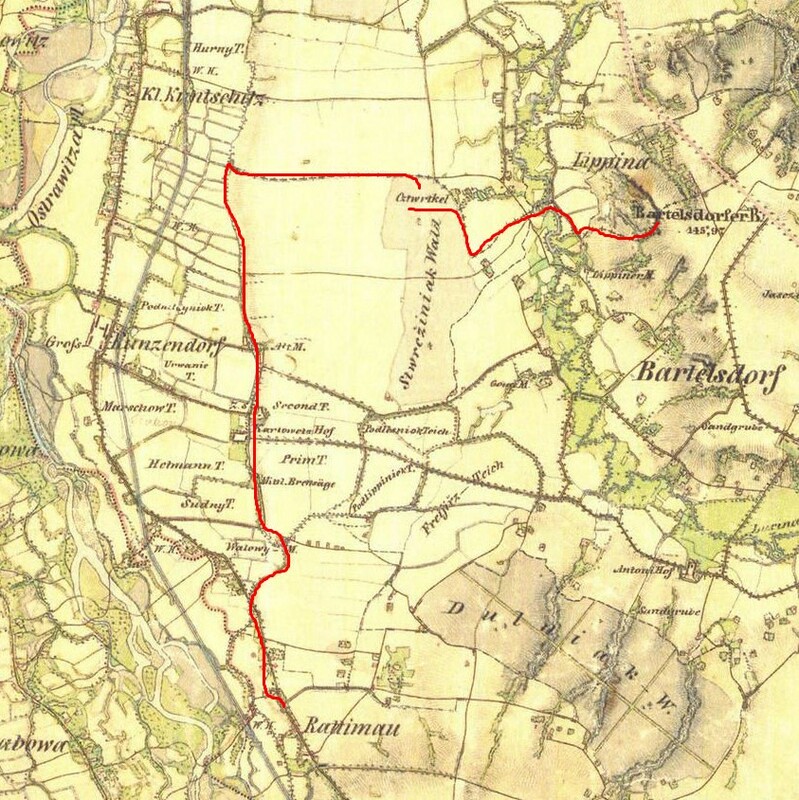 Kunčice 6 has a record for Marianna Thomanek purchasing Velké Kunčice 84 on 13 September 1823 from Anna born of Georg Thomanek and married to Johann Waschiczek of Rakovec to the sister Marianna Thomanek of Gross Kunzendorf. Marianna Thomanek would have been called by Krčmarská in 1823. I still think that Josef Vašíček married Josef Krčmarský’s sister Marianna. Marianna Tomanek, who is somehow connected to the one in this record. How exactly, I do not know. Jan Vašíček from Rakovec and Josef Vašíček from Vratimov. Marianna Tomanek from Velké Kunčice who was the daughter of Wenzel Tomanek. 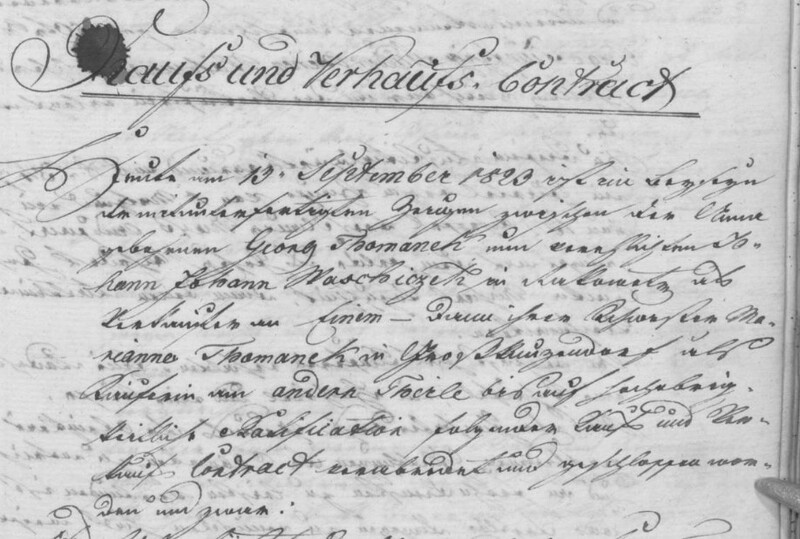 I also went on another round of searching through the matriky and found that there is another potential candidate for Josef Krčmarský born in Bartovice on 28 February 1782 to Michael Kertzmarčzjk and Marina at Bartovice 73. My current theory is that Josef Krčmarský is the son of Michael Krčmarský and Marina. All of the other evidence, the land records and the estate permission to marry records, point to his father being Michael. I checked for deaths of Josef Krčmarský in Nová Bělá 36 from 1841-1877. I did not find any other possible deaths. I also checked for the death of Josef Havranek in 1840-1845, but I did not find that here either. My thinking was that if he could get confused in life with this guy, maybe he could get confused in death. And maybe it was because of some kind of jména po chalupě going on, since Havranek seems to have been one of the previous owners (perhaps even in the deep past?) of Velké Kunčice 43/Bartovice 73. I think this might be the death of Michael Krčmaržík, age 45, of kolik on 22 November 1795. But then why does it say he was living at [Bartovice?] 32? 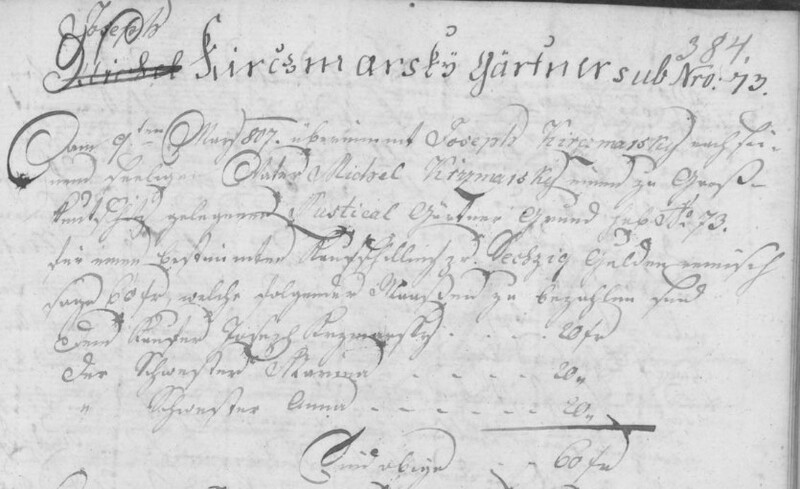 I kind of think that this land record is saying that Michel Krčzmarčzik bought Bartovice 73 from his father Jan in 1772. I guess if he was 45 in 1795, he would have only been 23 years old at this point. All the children of Josef Šumbera and Anna Krčmarská emigrated to Texas and the families spread extensively. There are many descendants here who are interested in this same research. I am especially grateful to be able to share this with my cousin Carolyn Šumbera Heinsohn, whose research helped me greatly over the years. She has done extensive research on the Šumbera-Kruppa families, and it feels really great to be able to give back some new research to her, as tenuous as it still is. After doing this research, I feel confident that I have some solid leads, and that there actually is some hope of tracing this line back in time. I also feel surprised that I was able to understand as much about the land records back in 2014. I was not confident, had very little understanding of the context of their creation, and I definitely drew wrong conclusions. But it was really only two or three tiny pieces of the puzzle that I was missing. I have my friend Lukáš Svoboda to thank for patiently helping me to understand these records better. My great grand father Peregrin Fiser immigrated to Texas in May of 1876 with his wife, Filomena (Vacek) Fiser and three children from the Landskroun area of Bohemia (Dolni Dubrouc and Cermna). She was pregnant with my grand father Joe P. Fisher who was born in Hostyn Texas in December, 1876. My grand father married Frances Sumbera who was the daughter of Anton Sumbera from Velke Kuncice. I thought it was Moravia but may have been Silesia. I have a cousin, Carolyn (Sumbera) Heinsohn, whose grandfather was Anton Sumbera and he married my grand father’s sister, Andela Fiser…double marriage in these two families. Carolyn is well versed in the history of Czech families who immigrated to Texas and she is involved with the Czech Heritage Center at La Grange, Texas. Josef Sumbera may have been a brother to Anton Sumbera. I’ll have to check on this later.